Fantastic views from ocean terrace rooms n restaurant/ cafe! Nicen cozy place for a retreat. Owners n staffs r super friendly n very accommodating too! Located at the view point. So the view is fantastic. The food is very tasty and prices are safe for your vallet. Service is not very good, but fast. For example I had to ask for menu and napkins. Чудесное место! Очень вкусно, атмосферно! Какие десерты! Попробуйте первое в меню, мороженое банановое с клубникой! Amazing view, great yoga classes, inspiring teachers, delicious food and nice rooms! 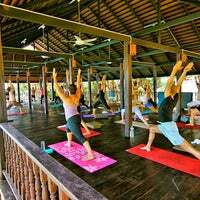 Great atmosphere, mind-blowing view, happy people, amazing food and yoga classes with the sound of the ocean. Pure bliss! Шикарная еда, очень качественно и вкусно. Ну а вид один из лучших на острове. Must-visit. Yoga room and teachers are great! Amazing view and very delicious and healthy restaurant. Avoid the room right next to the pool, if you get crazy group guests party until 2 am in the morning, unlucky for you to get sleep! What a great place to lunch or have dinner, what a view ! Очень вкусно. А вид просто потрясающий! место очень атмосферное и уютное,а вид здесь, действительно изумительный. 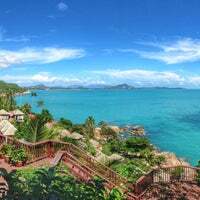 Get the ocean view room, it is perfect! Атмосфера, обслуживание, ВИД, здоровое питание. Yoga! Great view! And food also. Good food, great views, unfriendly and slow service. 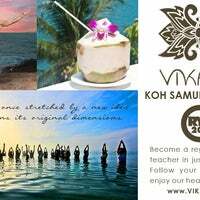 Vikasa Yoga Retreat Thailand is a boutique yoga resort and organic restaurant offering an inspiring yoga environment created by Konstantin Miachin. "Great place to train and take private lessons. Worth the trip!" 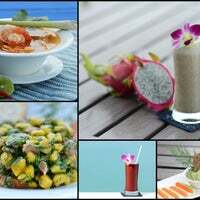 "Clean and nice place, good massage"
"Beautiful decoration and sea view delicious vegan dishes. 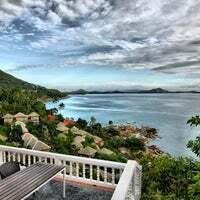 No other alternative in Koh Samui"
"It's a beautiful beach, & right we are in off-peak season, you can have a much fun, quiet time with your belovers!!" "Nice nightmarket .Tasty thaifood( especially noodle soup and pad tai) but pancakes here no so good.."